Make a lasting impression! Serve an Amana Spiral-Sliced Ham as part of a lavish buffet, or give as a memorable gift to employees, customers and friends. You and your recipients will love the ease of preparing and serving this ham. The superb taste comes from slow smoking over hickory. 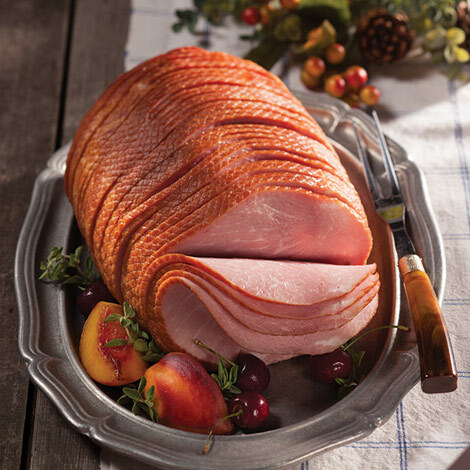 Amana Spiral-Sliced Hams are available in both boneless and bone-in varieties. 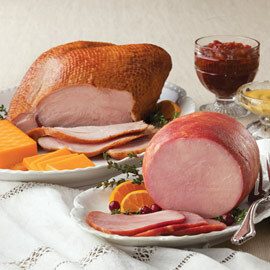 Our Boneless Hams will serve 3-4 people per pound. The Bone-In Spiral Sliced will serve 2-3 people per pound. This is how you send great meat products to your family and friends!! What a fantastic job. Would recommend. Ordered your Spiral Ham and is was GREAT. Not salty, great flavor and cooked easily.Will purchase more products knowing the quality of products you have. I was so please with the spiral ham we purchased from Amana meats! It was the best ham I've ever eaten, and it helped make our Easter very special. My first purchase from Amana but definitely not my last, Lord willing! Smoked bone-in ham, bacon, smoked brats, and smoked cheddar. As always, so delicious and arrived on schedule! The ham arrived exactly when it was promised. It was a hit at our graduation brunch and so easy. Thanks!!! Yum! Easy to order! Always on time! Every holiday I order these delicious Amana hams. My family has come to tell me they don't even want turkey any more for Thanksgiving. I love how easy it is to select my ham (bone-in vs. spiral cut) online. The history of my past orders is very, very helpful in remembering what size/type I order from event to event. I love their calendaring system when selecting my delivery date as well. I've ordered for almost 10 years now and the deliveries are spot on. Yum! Yeah! The spiral sliced ham was delicious and flavorful! Can't ever go wrong with Amana! Quality is always the highest! Bought a spiral sliced ham for Easter. It was delivered when they said it would be, and it was delicious !!! I would strongly encourage anyone that has not bought Amana meat products, to give them a try. The food is great, the service is impeccable and the people in Amana are very friendly. Amana Response: Thank you for your kind words, Glenn. We appreciate your business very much! A quick warm up and dinner was ready to go. The ham was great on Hawaiian sweet rolls, and everyone loved it however they chose to eat it. It was good with Hoer' Devours as well as with warm and cold sides. This ham definitely lived up to its billing. Everybody loved it. My only criticism is that it arrived two days later than expected, necessitating some last minute menu changes. I've been getting these hams for Christmas and Easter for about 10 years now. Yum! and Double yum! The service from Amana is tops as well. I can put in my order a month ahead of time for a specific date and it always arrives on time. It's so convenient. If I have a question and call, a REAL person answers the phone. What a concept! Thanks Amana! My ham was absolutely delicious! Could not have been any better, truly believe this was the best ever. We have not tried this ham yet as it is for Thanksgiving. We did grow up in Iowa and have been to The Amana's so I am sure it will be as good as it as back then. Was very happy to find the website and the ham was delivered very quickly. Perfect size, great taste and fast delivery. Will be back again to order. The family we ordered it for received it in excellent time. it is for Easter so we have not eaten yet. Arrived on time; quality excellent...will do it again! Absolutely the best ham we have ever eaten! Served for Christmas dinner. No waste, low salt content and sweet tasting! Will purchase another next year for sure! Very nice. So simple, just heated and served. Perfectly cut and good flavor. The hams we ordered were excellent! (We also ordered a honey baked ham and sent another ham to friends in California.) The meat was delicious--low fat, easy to prepare, and easy to serve. The only problem we had was the ham we sent to California arrived two days before the ham we ordered to be delivered in KC--ordered on the same day. I chose the "soon as possible option" and should have called or checked further because going to the UPS Distribution Center to be sure we had the hams in time for supper was a hassle. However, the nice UPS people were helpful and had Christmas cookies. We will continue to order hams from Amana Meat Shop, but will remember to place the orders earlier than Dec. 17. My wife is from TX where they eat tons of ham. This was the best ham she ever ate! And of course I knew it would be since it came from Amana. Amana Hams are fully cooked and ready to eat. To serve warm: if frozen thaw in refrigerator, remove packaging and place on a rack in a shallow pan or roaster with a small amount of water. Cover with foil or lid. Place in a pre-heated 275 degree oven. Bake approximately 14-15 minutes per pound, or until the internal temperature reaches 135°. 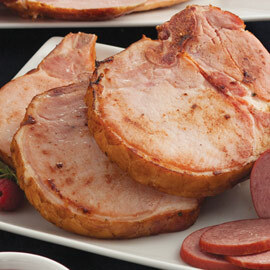 We recommend basting with the ham liquid or your favorite sauce during the heating process. Tip: Give our Horseradish Jelly a try - delicious! Call to order.